Killer combo of chunk. 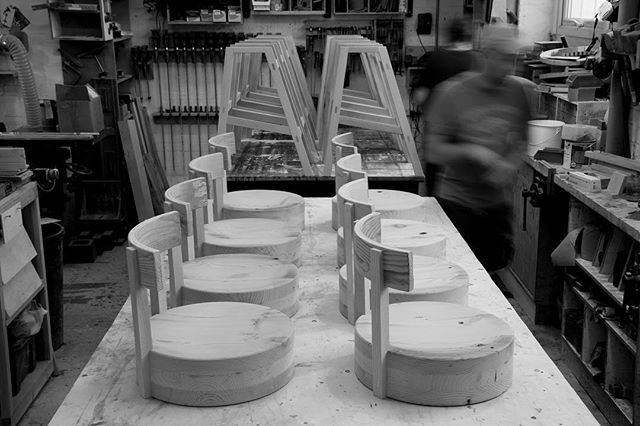 Sat here with our ‘little one’ chair, One of the Completed tables taking a final moments reflection before delivery. Table bases bathing in the late autumnal light. Once all oiling is complete we give them a little sunshine before the final pairing of top to base. .
Awaiting final assembly. The ‘Big one’ is a solid chunk of seating Honed from rough and seasoned roof trusses and refined with a craftsman sensibility into delectable objects of desire. 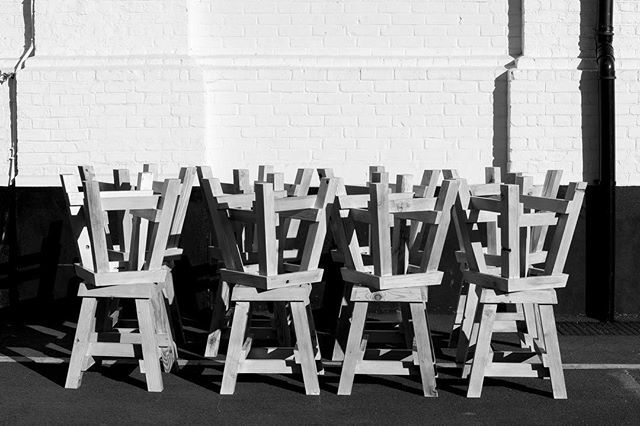 The smoothed and dished seat is Paired with a refined English Ash frame offering stylish seating for the discerning drinkers of their local brasserie. .
Racked and stacked. After all the assembly work is complete it’s over to the finishing shop for a final de-nibbing in preparation for an oil finish. As some of the furniture will be used outdoors we have to add In an additional base layer of waterproofing and use an oil that contains UV filters to help prolong the durability against weathering. In all We use three coats of Osmo oil with the middle coat having a white tint, this x3 oil combination alongside our fine joinery offers a reassuring quality. 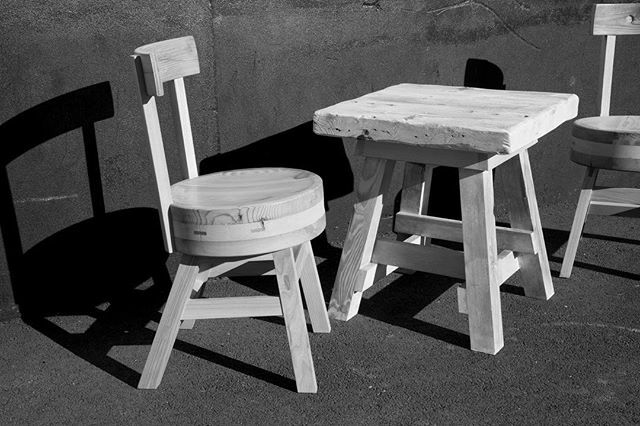 Our furniture is built to last. .
Burger time. The laminating of the seat sections. 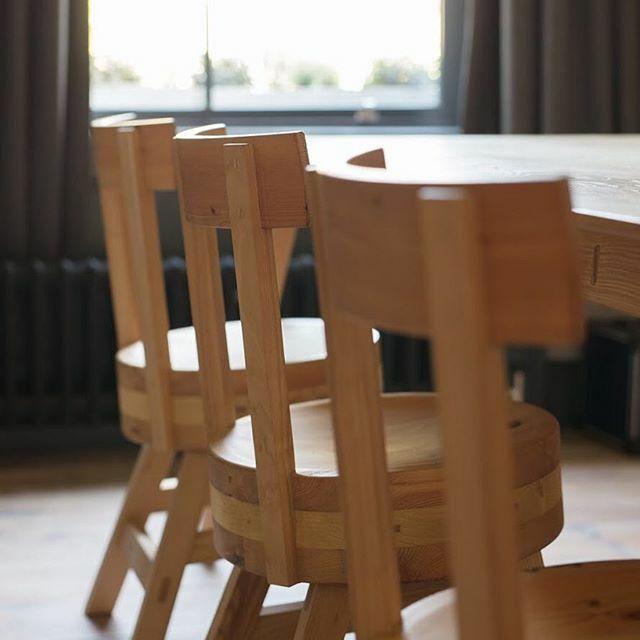 We use reclaimed Douglas fir top and bottom and a spruce (meat patty) centre section, a thick coating of tite bond burger sauce binds them together creating a chunky 120mm seat depth. We machine a slight dish into the top surface which adds a great deal of comfort, cupping ones cheeks against the delightfully smooth finished surface. . Chair back rests in process. A great way to achieve a curve is through lamination. We use a 5 board lay up x3 reclaimed and x2 Ash at 4mm think a piece. It takes a great deal of pressure to persuade these timber sections into the perfect curve and the results are worth the effort. 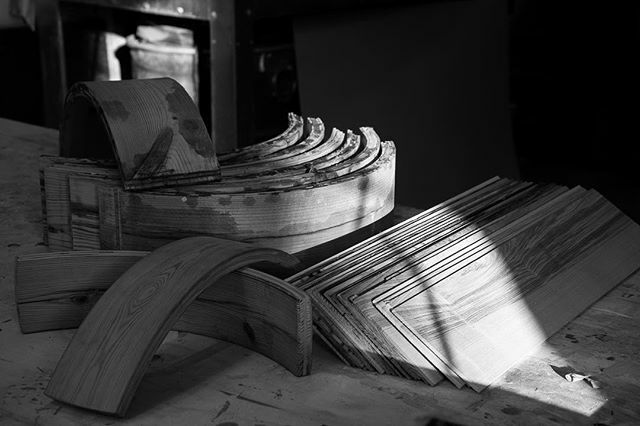 Keeping the flavour of reclaimed and forcing into a curve leaves a very satisfying component and also one of the last to be fitted to the near complete chair once the maker has refined the surface finish and individually cut and selected each finished piece to complement the respective chair. Final stages before an oil. The drill press set with a 10mm plug cutter. 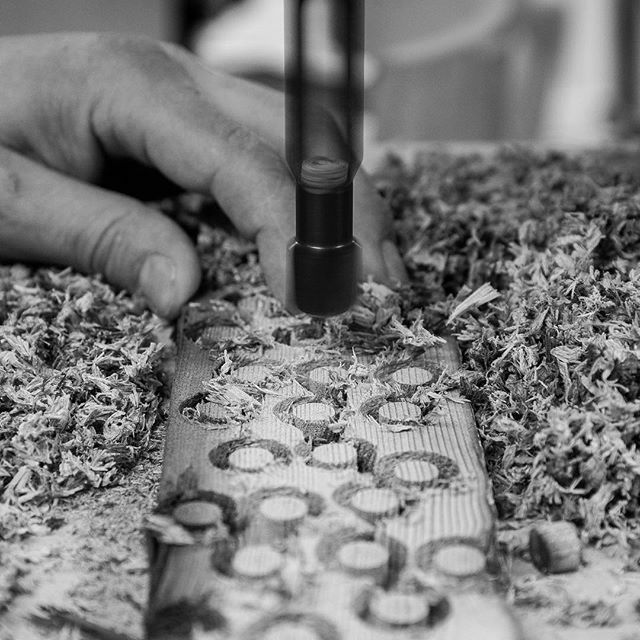 Although it’s a repetitive process the maker is rewarded with a satisfying sound and the delicious sweet lemony scent of cutting through reclaimed Douglas fir and spruce. . The digital intervention. 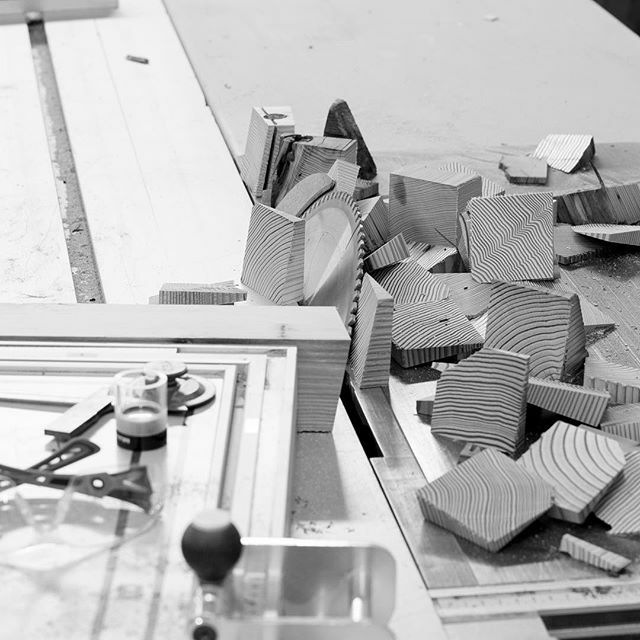 Our CNC machine works in sync with our makers needs and allows us to further our capabilities as a workshop. Allowing us to investigate various forms through textures and pattern. 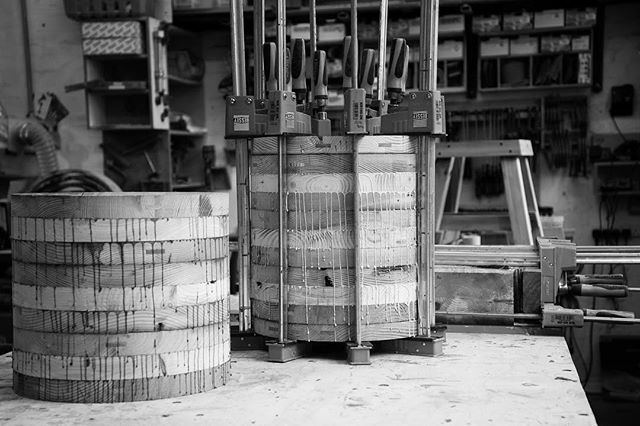 The repeatable nature of this machine is perfect for taking prototype projects through into batch production, a perfect accompaniment to our traditional joinery machines. .
No batch production would be complete without the intervention of the makers hand and his swift and methodical use of the sharpening stone, an essential skill of any furniture maker to master. 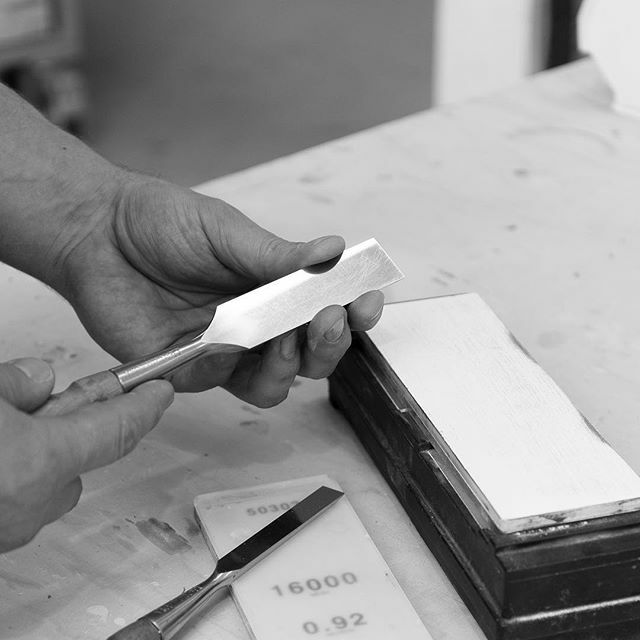 The Workshop preference, once an initial flat back and edge has been established is to hone and polish using a 16000grit Shapton glass stone, its a very fine water stone backed to glass to keep the stone flat and offers the maker a chance to refine his tools edge sharper than a surgeons scalpel. 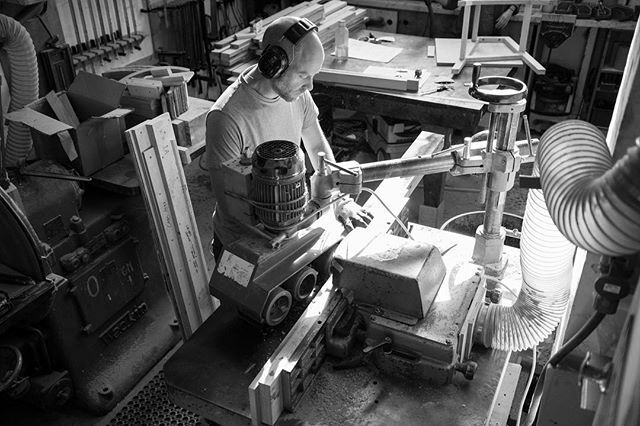 Essential for shaving fine wisps of wood for that perfect final finish. .
One of the kings of batch production is the spindle moulder. 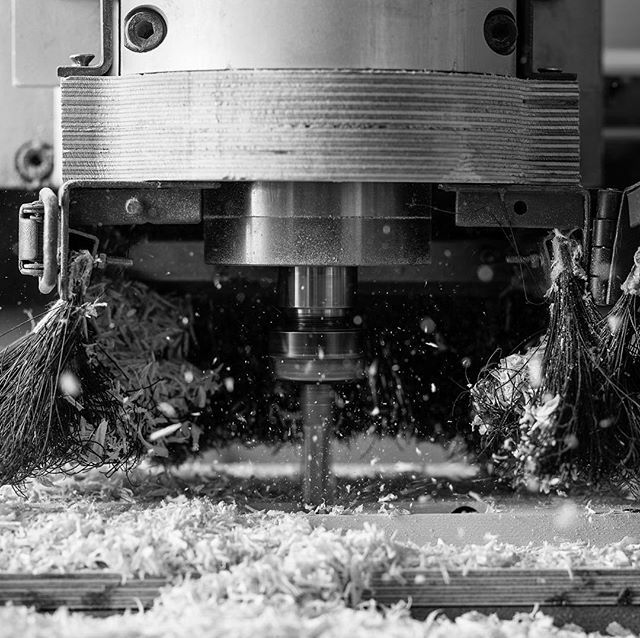 Delivering consistent repeatable quality and being able to use a vast array of cutter profiles and accessories makes the spindle moulder one of the most versatile machines in the furniture makers repertoire. Shown here is Sam deep in concentration processing reclaimed timbers using the in/out feed drive making it a semi automated process. He is cutting double 8mm grooves for loose tongues which we use to join up our table tops which are destined for a new bar project with @box9design for @no17dickensyard . Abstract forms from the workshop. 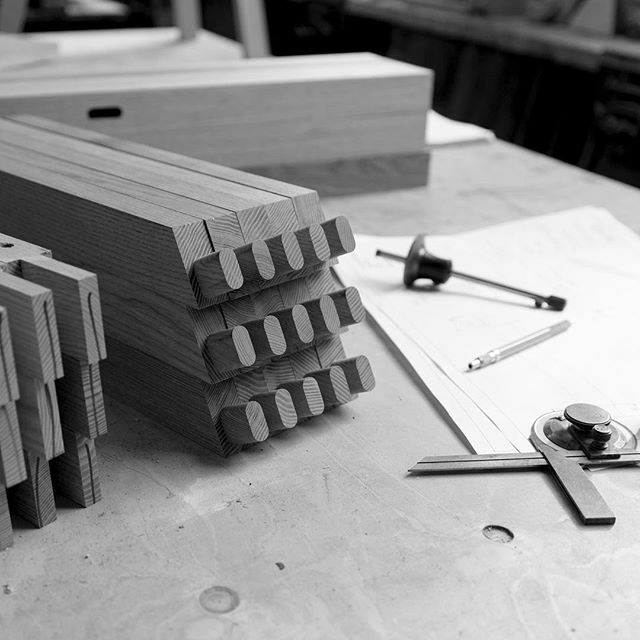 This beauty is what turns rough sawn timber into dimensionally accurate smooth timber ready for further processing. 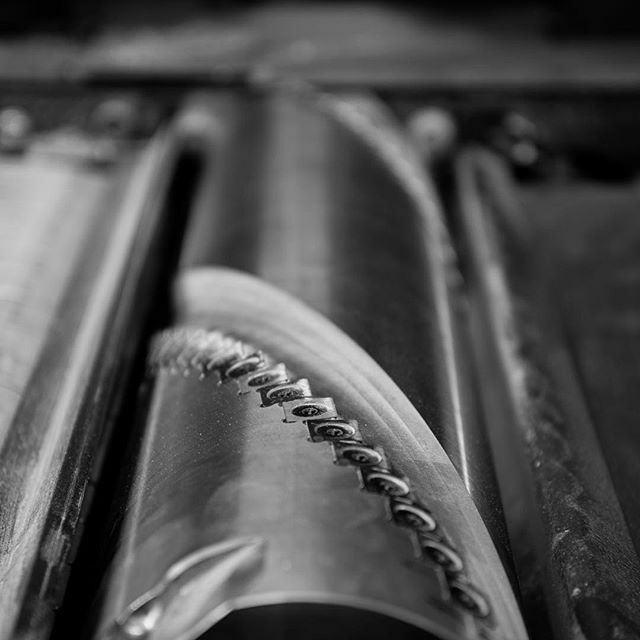 The spiral cutter is an absolute dream on awkward grained timbers and has consistently delivered a superior finish to 0.1mm accuracy over 500mm wide. It’s a great piece of performance engineering and an ideal accompaniment to the modern craftsman. . The chair and table build continues. Working on a brand new design with @box9design for a new bar/eatery in Ealing, West london. 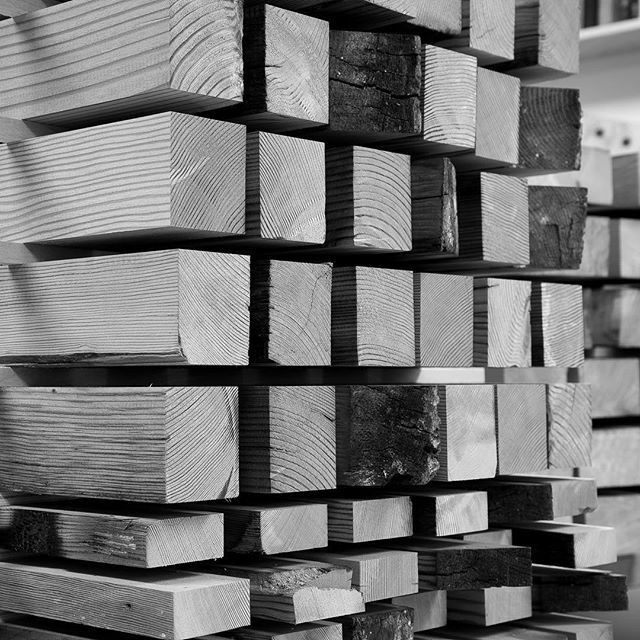 Shown is a stack of sawn and planed reclaimed Douglas fir acclimatising itself before final dimensioning. .
A section of chair components caught in the beautiful autumnal afternoon light. 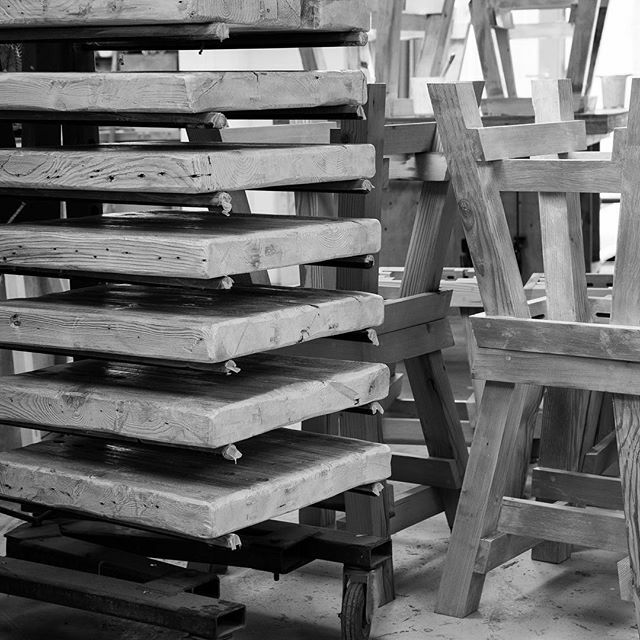 Working on a batch of our Big one stools for @box9design for a new Ealing Bar/eatery. And congratulations box 9 for recently winning best pub and best overall uk bar @restaurantandbardesign awards for @no29powerstationwest which we also provided some fine seating for. Looking forward to seeing the final results. . 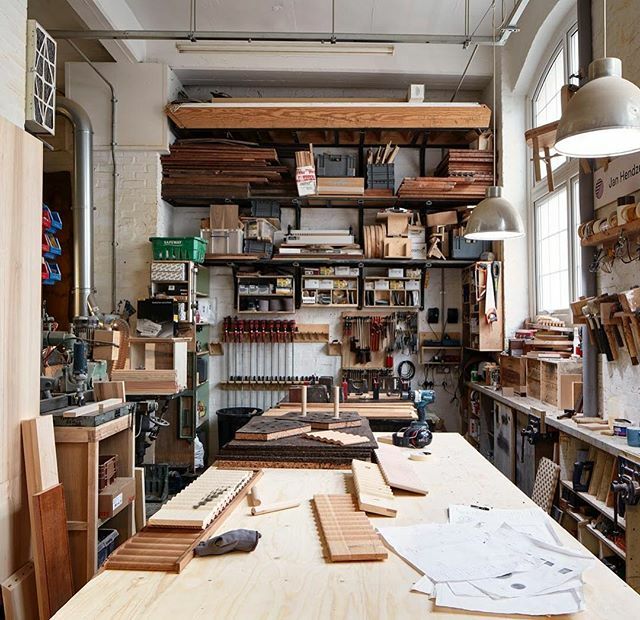 There are many joys and also many perils of working with reclaimed timber. 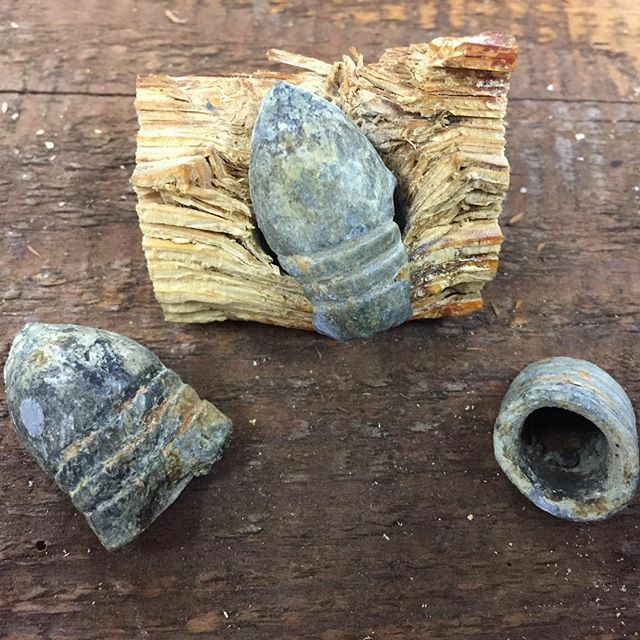 After a recent de-nailing session of roof beams from a property on Chelsea embankment aside the usual culprits we discovered a semi mangled bullet, upon further machining of the timber we discovered the best part of two whole specimens to much excitement. A bit of forensic work and it appears we have some ‘minni balls’ a type of muzzle loading spin stabilising rifled musket bullet which came to prominence in the Crimean war 1853-1856 and American civil war. Now what we want to know is the story of how they came to be trapped in the tree. Was it MURDER or just a little bit of fun? 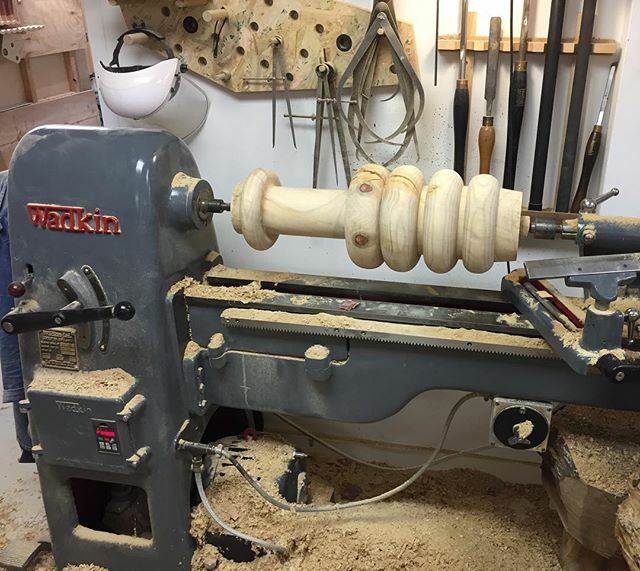 A recent addition to the workshops repertoire of machinery, we have acquired a fully restored wadkin RS8 lathe and it is an absolute beauty. We are currently deep in the investigative stages of production/prototype capabilities and look forward to sharing our experiments and furthering the workshops capacities. Thanks to Mark @wadkinrestorations For sourcing restoring and delivering an absolute dream of a machine. .
Igbo day West Midlands new yam festival. 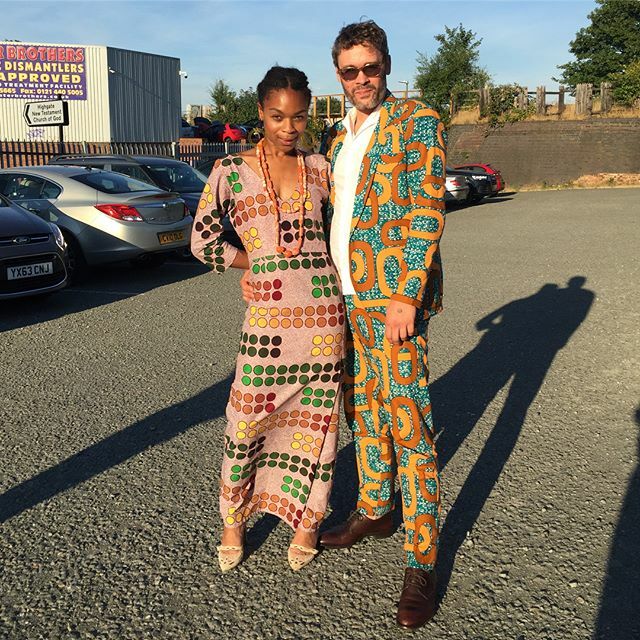 Proper Nigerian party vibes. Tailored suits a plenty. The Iwa ji festival meaning ‘new yam eating’ is practised throughout west Africa especially Nigeria and Ghana and symbolising the conclusion of harvest and the beginning of the next work cycle. Folk dances, masquerades and tasty eating a plenty. The colourful festival is a visual spectacle of coherence of dance, of joy and feasting. .
After months of working on our most prestigious project to date @japanhouseldn consulting, fabricating and installing a fine array of joinery items for a Japanese cultural centre, the studio is back in full swing and looking to take on exciting projects, special commissions and collaborators for new work. 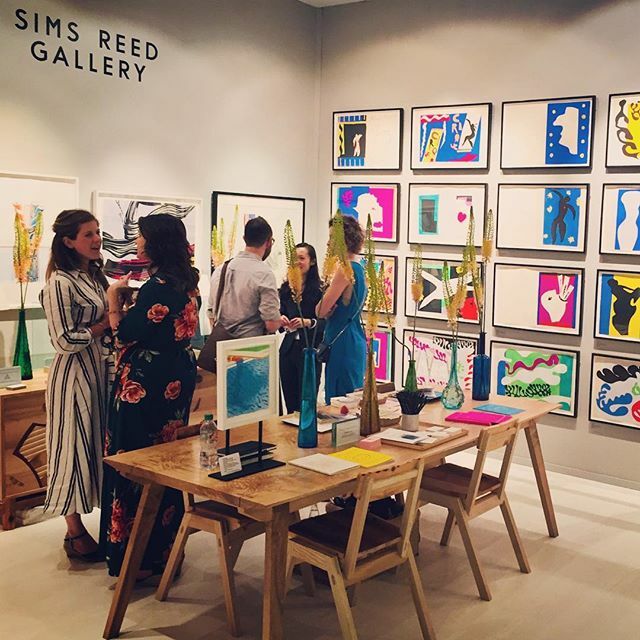 Don’t be shy, get in touch. X .
Sunshine is upon us. The little big one chair resplendent in the golden glow of the afternoon light. Produced from reclaimed Douglas Fir roof trusses and English ash. .